1-CD DigiPac (6-plated) with 60-page booklet, 30 tracks. Playing time approx. 76 mns. 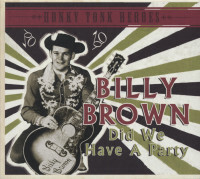 A landmark first-ever CD by one of the best but least celebrated country and rock & roll singers! This was the hard-luck guy who recorded the original version of Jim Reeves' mega-hit, 'He'll Have To Go'! 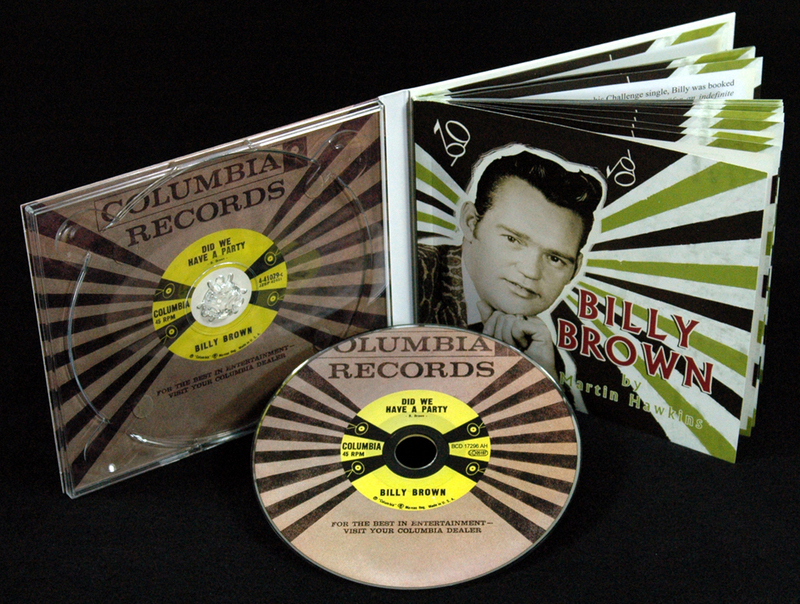 In all, 30 top class rockabilly, hillbilly, country, and rockaballad tracks recorded between 1950 and 1969 in Nashville! Includes all 8 highly collectible rock & roll and country singles recorded for Columbia in the early and late 1950s, 2 singles for Decca and Stars from the mid-'50s, 3 Republic discs from the early '60s, and a single on Challenge from 1969! Plus two unissued tracks from Challenge! Includes Brown's classic rockers 'Did We Have A Party', 'Flip Out', and 'Meet Me In The Alley, Sally'! 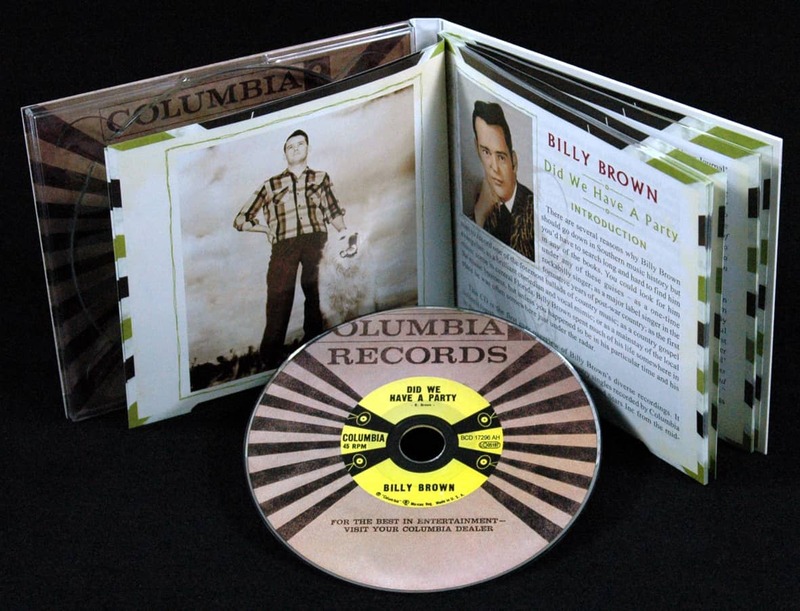 Brown was backed by the cream of Nashville musicians, including Jerry Reed and Ray Stevens! A 60-page booklet by Martin Hawkins contains the first ever retrospective of the remarkable career and amazing life of Billy Brown, based on new interviews, and many unpublished photographs! And of course the original recording of 'He'll Have To Go', one of the most enduring and iconic songs in country music! This important CD fills a gap in the story of '50s and '60s music, bringing together all known recordings by a top-drawer singer who never had quite the right break. 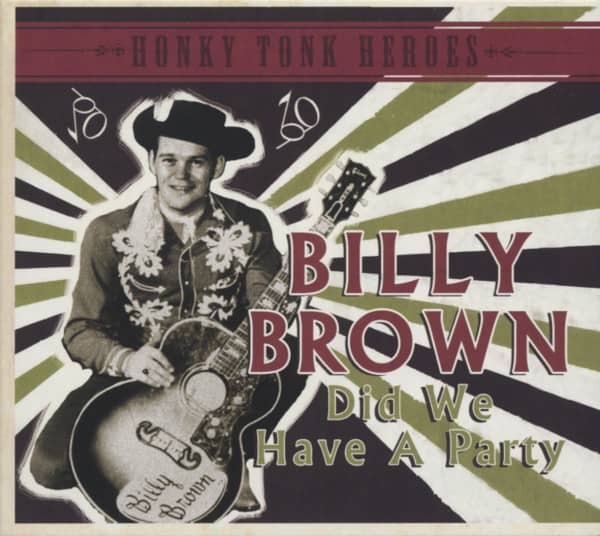 Billy Brown was a rodeo performer, a hillbilly singer, a rockabilly, an unrivalled balladeer, a country gospel evangelist, and a mainstay of the central Florida music scene. He spent most of his life in the music business, usually just under the radar. He wrote many songs, recorded for the right labels, but never quite made it in his lifetime. For all that, he left a lot of music to enjoy. And the original version of 'He'll Have To Go', as good in its way as Jim Reeves' recording! Our man, William George Brown, was born on 22 July 1929 in Princeton, West Virginia, near the Virginia line, the son of George and Sadie Brown. It was an area where the main occupations were mining and railroads. If George Brown started out as a miner, he was a railroad man by the time Billy was young and before long he relocated the family to New Smyrna Beach towards the southern end of the Florida East Coast Railway. Brown's friend Arnold Rogers said: "Billy told me that he moved to Florida from Princeton when he was eight years old." Billy's widow, Jan, said: "Billy's dad worked on the Florida railroad. He was a brakeman. After they settled in New Smyrna Beach he also had a business running a mobile skating rink in the 1940s. They would set up a wooden floor and pitch a tent over it and then move it from place to place. Billy and his younger brother Tommy were both involved with that as children. When Billy's daddy retired he worked as a jack of all trades doing handyman jobs for the local Police Department. Everybody knew the Browns in Smyrna." One of the things people knew the Browns for was music. Billy was quite young when he realised he had a talent for it. He later told Jim Jones of the Smyrna 'Observer' newspaper: "I had been told I had a good voice. If I heard a song, I could learn to sing and play it. 'Old Shep' and 'Silver Haired Daddy Of Mine' were two of the first songs I learned to sing." He told Jones that he sold twelve boxes of Cloverine lip salve on the streets in order to make enough money to buy his first guitar, choosing that product because he saw it advertised on the back of a comic book as 'good for anything and everything'. He spoke too about an early set-back that also spurred him on. He was in the eleventh grade class of Ms Dilzer: "I was sitting in the study hall and I was writing the song 'Trusting Heart'. She came up and was standing over me and said, 'Mr Brown, what are you doing?' and I said I was writing some songs I hoped to record someday. She said 'Frankly I don't think you are good enough'. I got up and left school and never went back." Billy told Arnold Rogers that his favourite singers in those days were Gene Autry, Eddy Arnold and Elton Britt and that he started performing as a teenager. He also talked to John Carter of the 'Daytona News Journal' about his early life: "[I] used to 'hang out' with a lot of the railroad men and learned about 'chawin tobacco,' traveling around and the hard life. Sometimes I learned the chords and the words to some folk songs. I remember when I used to buy a round-trip bus ticket from New Smyrna to Daytona Beach. I'd stuff my guitar into a pillow case and walk around the streets until some man would say 'Boy, can you play that guitar?' I'd haul it out and then play on the streets and then somebody would pass the hat around for me." He also remembered: "One time I made $18 in Daytona Beach. I came back and told my dad, 'you can retire now'." From there, Brown took to singing at local events and functions and even combined this with another of his interests, the rodeo, where he became proficient in the cowboy arts of gun-twirling and singing like Gene Autry. By the age of sixteen he was singing in touring shows and there is an undated photo of him working as a rider at the Oklahoma City rodeo. He also sang at rodeos with a group known as the Indian River Boys. As a singer, he gradually worked his way up until he was invited to play in some of the nightclubs in central Florida. Then a big break came his way. He told John Carter: "In 1950 I signed a contract with the Grand Ole Opry and was headed for Nashville when the Korean War broke out." The Nashville connection was made by two brothers from Palatka, Florida, Pearly and Abner Shivers, who heard Billy singing in a night club in the summer of 1950 and arranged an audition for him. Billy told Arnold Rogers how he was "singing like Eddy Arnold and yodelling like Elton Britt. Abner Shivers really liked Billy's singing and he contacted either or both Jim Denny or Troy Martin in Nashville. Jim was at the Grand Ole Opry and Troy had an inside track to Columbia in those days and one way or another Troy got Billy onto Columbia Records." A contract with the Opry seems unlikely for a complete newcomer but it could be that Jim Denny arranged something with radio WSM's other shows. Rogers remembers Billy saying he "played some radio shows such as 'Noontime Neighbors' on WSM in Nashville when he went up there to record but he never did go out on tour or anything, he stayed in clubs around home." Troy Martin was originally from Danville, Virginia where as a child he was stricken with polio, leaving him with one arm shorter than the other. He went into music publishing with Peer International after the war and moved to Nashville in the early months of 1949 to develop an office there for Peer. He was based downtown in one room at the James Robertson Hotel on Seventh Avenue. Arnold Rogers remembered: "Troy told me numerous times of his early struggles to get songs placed with artists. Acuff-Rose had Roy Acuff and Hank Williams sewed up and Hill & Range had arrangements with Ernest Tubb, Red Foley, Hank Snow, Bob Wills and Eddy Arnold. Finally, he met Don Law at Columbia and finagled an arrangement where Troy could act as an unofficial talent scout for the label and retain the publishing rights to nearly all the songs recorded. It turned out to be a good deal for both men. 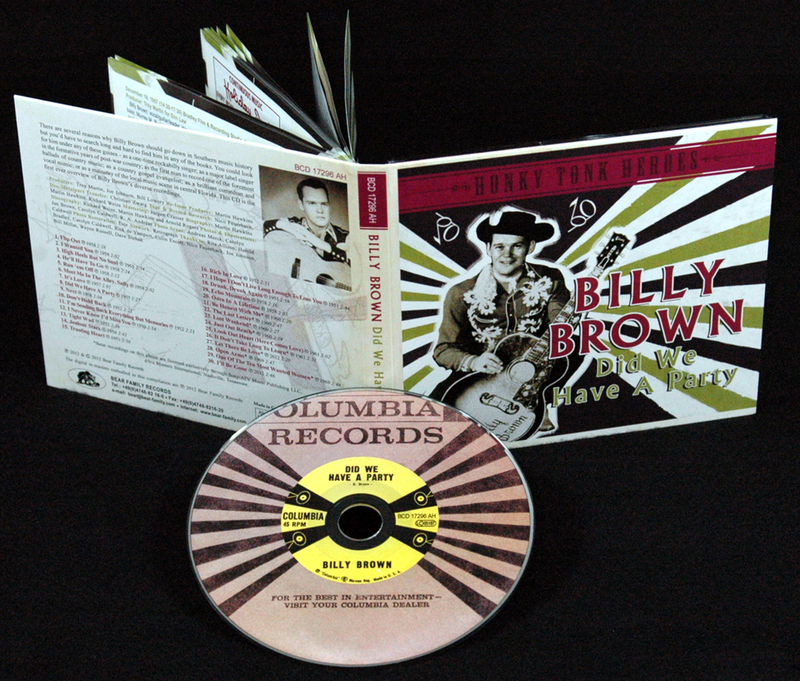 Troy Martin was responsible for getting any number of new artists - including Billy Brown - on Columbia." In those days Don Law spent as much time in Columbia's Connecticut head office or in studios in Texas as he did in Nashville, and he was happy for Troy Martin to help look for new artists. Martin looked principally in Knoxville, Tennessee and in Dallas, Texas and Billy Brown was one of a number of singers joining Columbia that included Carl Smith around April 1950, Lefty Frizzell in July, Billy in September, Flatt and Scruggs in November and Ray Price the following March. Another Nashville record man, Murray Nash, said "Troy Martin swung a big stick in Nashville in the 1950s." On 28 September 1950 it was Troy Martin who oversaw Billy signing a one year contract with Columbia and who took him into his first recording studio. Columbia did not file the session in detail enough to confirm the studio or the musicians but it was almost certainly the Castle Studio within Nashville's downtown Hotel Tulane. The first session produced four songs from which Don Law and Troy Martin chose two single releases. The first coupled I Never Knew I'd Miss You with Jealous Stars. From the opening bars of Billy's own song I Never Knew it was clear that he could sound almost more like Eddy Arnold – then the top star in country music – than Arnold himself and that the band could sound like Arnold's band which featured understated lead playing on steel guitar by Roy Wiggins. Very possibly some or all the band were Arnold's recording musicians. Jealous Stars was a studied ballad written by Brown's friend from back home, Allen Bradley, and again the recording featured Billy's smoothly controlled vocals - almost impossibly mature-sounding for a 21 year old. The disc was issued on 4 December 1950 and the trade newspaper 'Billboard' welcomed I Never Knew especially, saying the singer "unveils a light, relaxed and heartfelt style – performance is much superior to material." The second release came in April 1951 and doubled I Hope I Don't Live Long Enough To Lose You with Trusting Heart. The latter was Brown's eleventh grade composition that tells how his heart is easily torn apart – prophetically as it later turned out – but again the template for the music and solos comes from the Eddy Arnold songbook. I Hope I Don't Live Long Enough was a song in the same vein written by Nashville session pianist Marvin Hughes, who might have had a hand in the production. 'Billboard' again highlighted the lack of originality in the material, finding Hughes's song a "country love ballad cut from familiar cloth [but] takes on added meaning via Brown's heartfelt chanting" and Trusting Heart a song "Brown again lifts a shade above the ordinary." 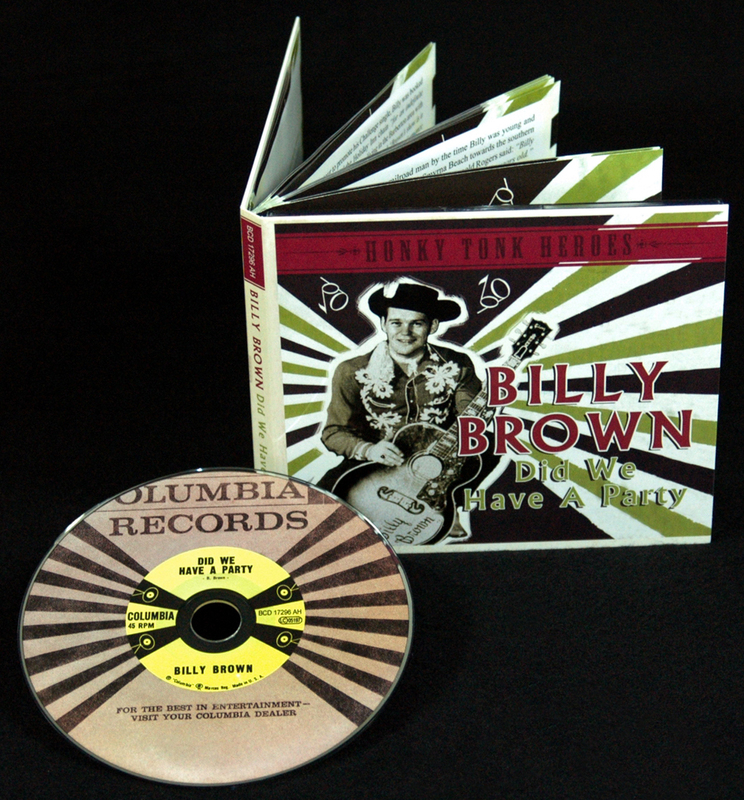 Within a few months of signing for Columbia, having his official publicity photos taken, and apparently also signing up for the 'Grand Ole Opry', Billy Brown was drafted into the Army. Years later he told reporter Jim Jones that "the night they drafted me I went to see Mrs Ivey, the head of the draft board, and asked if she would defer me until the records came out, but she wouldn't do it." Customer evaluation for "Did We Have A Party - Honky Tonk Heroes"
The fat booklet has great notes, photos and session details. Another highly recommended Bear Family disc. Eine tolle Veröffentlichung in der neuen Serie \Honky Tonk Heroes\". R & R Musikmagazin 6/2012	H.G. Hartig"